The Stone Picture Frame With Angel Urn is charming with its accompanying angel carrying a bouquet of flowers and leaning against the urn. "Forever in our Hearts...." is engraved into the urn as a lasting sentiment. This cremation urn can be used for a very petite adult or teen under 5 ft tall, or young child with a healthy weight of less than 80 pounds. 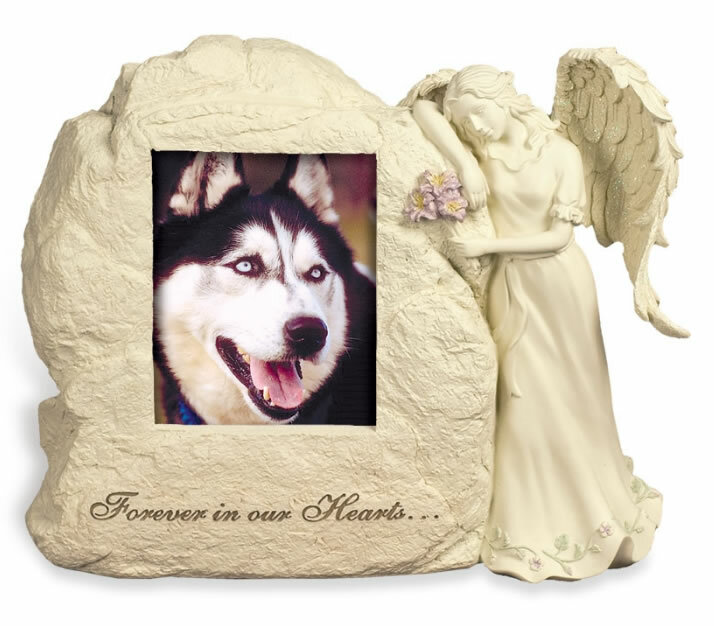 This urn can also be used for a beloved pet with a healthy weight of less than 65 pounds. Cast from crushed stone and resin, it has the look and feel of carved stone. Because of the rough texture of the urn, it cannot be personalized with engraved name and dates. Many customers opt to place a small engraved name plate in the bottom of the picture frame. These name plates can be purchased at your local trophy shop. The picture frame holds a 5" H x 4" W photo. There is a slot at the top of the urn so that the photo can be changed periodically if you wish. The cremains are loaded through the bottom of the urn, which is then secured with a metal plate and four screws. 90 Cubic Inches is large enough for most youth less than 4 ft tall and with a healthy weight less than 80 pounds, or pets weighing less than 65 pounds when healthy. As with all urns, cremains should be in a sealed plastic bag inside the urn and this plastic bag will take up some of the room in the urn. The rule of thumb to determine the size urn you need for your pet is 1 lb of healthy body weight is equal to about 1.25 cubic inches of cremains. However, this can differ due to bone density, frame, and the cremation process used. Usually ships same business day if order is placed by 2:00pm Eastern Time. Ships from the West Coast.